It’s been really boiling hot this week and often without as much as the slightest breeze. Temperatures will easily soar above 30 degrees (86F) every day… and what makes it particularly unbearable is that it doesn’t start getting cool until at least 10pm at night. In the garden, my mint and oregano plants are going crazy. My basil is crying for more water and a little less heat. tarte fine (using puff pastry) with the thinnest of layers of Dijon mustard and thinly sliced, ripe tomatoes. Baked – first blind, then with all the toppings – in the oven for 15-20 mins. So simple but really tasty. salade niçoise – this French classic requires no introduction. soupe au pistou – using David Lebovitz’s recipe as my inspiration but adapted to what was in my cupboard, I made enough of this soup to last us several days. I prefer to serve it warm, rather than boiling. panzanella: this is an Italian summer dish, composed of stale bread, pickled red onions, basil and lots of tomatoes. Fresh, tasty and filling. I’ve promised the boy that, throughout the summer, there will always been something cold in the freezer. This week I made a granita (think of it as somewhere between a sorbet and an ice slush) and super-easy to make. lemon and raki granita. I love citrus flavours because they’re so refreshing. I’ve made Diana Henry’s pink grapefruit and Campari version many times, but it’s easy to change the ingredients depending on your mood. This time, lemon juice and lemon peel were mixed with a little sugar and heated until melted. I added a small amount of water and a generous glug of raki (an anise spirit very popular in Turkey) to give it a bitter kick on the finish. P.S. Pimms! It’s a lifesaver in moments like these. I leave the Pimms to macerate in fruit (lemon, apple, cherry) and mint for a couple of hours and then when the boy gets back from work, I fill up the jug with lemonade… and we go onto the half-finished house, once the builders have gone, and raise a glass to the future! I personally don’t have that kind of dutiful patience. For example, as much as I enjoyed playing the piano when I was a kid, I got so bored practicing one particular piece until it was faultless. I am also challenged in a couple more ways. First, artistically. Beyond stick figures and flow-charts, I have never displayed any kind of artistic talent. If I’ve got my camera out, I’m able to take a couple of decent photos but I have no pretences or leanings towards being a food stylist. 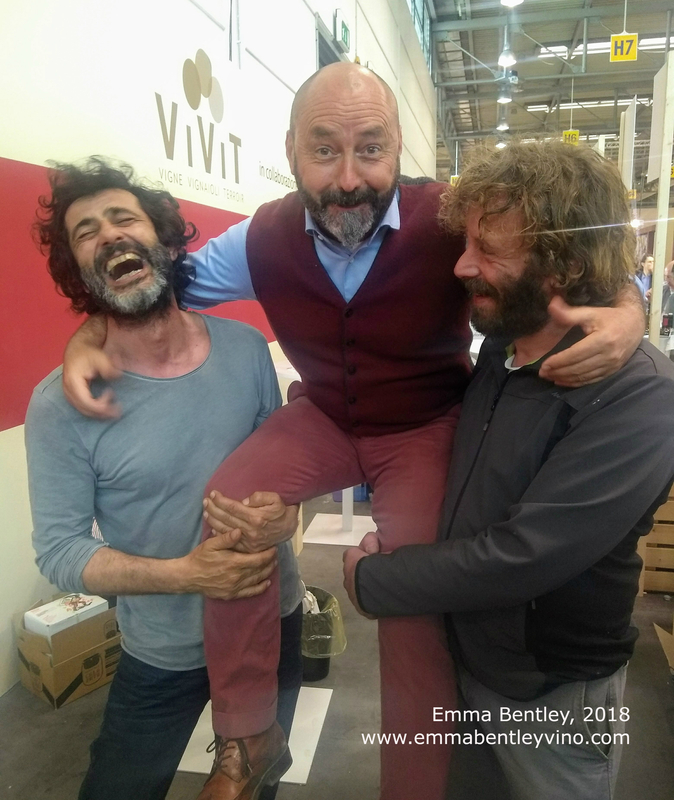 If that’s what you’re looking for, let me steer you to Emiko Davies, who has some of the most beautiful food photography coming out of Italy. Second, practically. I should be telling you about dishes which are easily replicable in your own kitchen. The problem is, my experiences over the last few years living in the UK, France and Italy, have rendered me and my house a unique blend of cultures, tastes and objects. This can’t be a normal food blog because what’s going on in my kitchen is entirely personal and therefore completely unreproducible. The done thing in Italy on the 1st May (Labour Day) is to organise a day-out in the countryside. It doesn’t matter if you’re already living in rural countryside, surrounded by vineyards…. there’s always somewhere more remote for you to escape to. Most days I’m up by 8am but we’d been at the Gusto Nudo festival in Bologna the day before and had only got home in the early hours of Monday morning. For the holiday, we were going up into the mountains above Vicenza (where Asiago cheese is made) to a friend’s house. It may just be in this particular area of Italy, but holidays and special occasions here are often marked by a grigliata or BBQ. In the UK, when someone organises a BBQ, you expect an outdoor charcoal grill, an undercooked sausage and, if you’re lucky, some red peppers and halloumi on a kebab stick. Almost inevitably, a rain shower will also be on the menu. Here in Italy, a grigliata is most often cooked on a large indoor fireplace. Old country houses are equipped with a wood-burning hearth on which you can cook all manner of meats – spare ribs, chicken, pancetta – and, of course, polenta. Polenta is everywhere in the Veneto. Two other girls were bringing savoury sides; we took wine (you never run dry with a winemaker) and I had been put forward for making a dessert. I’m really bad at cakes. I find them way too stressful. I prefer the kind of dishes that you can adjust during the cooking process rather than putting a mixture into the oven and praying to the gods of baking. As a compromise (and also because I had very limited ingredients at home) I decided upon a Bakewell Tart. If you’re not familiar with a Bakewell Tart, it’s a traditional English cake, made of shortcrust pastry, jam and an almond sponge. I used Mary Berry’s recipe for the shortcrust pastry, used a mixture of different jams (predominantly blackberry, made from the brambles surrounding our vineyards) and an almond-heavy sponge on top. I didn’t have time to fuss around with icing…. I just scattered some sliced almonds on top of the filling before it went into the oven. Considering I was so rushed, I was rather pleased with how it turned out. I learnt the Italian way of indicating “it’s tasty”: to put your index finger on your cheek and turn it back and forth! The croissant is so passé. My social media feeds this week (I’m looking at you in particular, Facebook) have been clogged with supposedly scandalous chatter of straight vs curved croissants. It’s pure semantics. Anyone who knows their butter from their margarine knows that the croissant was not created equal. So while we wait for the online world to straighten out their knickers, let’s put the spotlight on some of the more unusual pastries that you can find in a Parisian boulangerie. This morning, I tested a chausson au speculoos. It caught my eye because it’s not something you find very often. A chausson aux pommes, yes. Literally in French, it means a “slipper of apples” but more commonly, we’d say an apple turnover. The twist here is the addition of speculoos. If you’re not familiar with the word “speculoos” – first of all, why not?! – you may know the taste from those little brown sugar biscuits that tend to accompany your coffee. 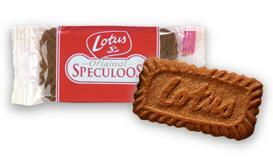 Speculoos, also occasionally spelt “speculaas“, is Belgian speciality. It combines sugar and butter with spices such as cinnamon, ginger, nutmeg, cloves and cardamom. In short, pure deliciousness in the form of a paste or a shortcrust biscuit. -> Yes, you can find a spreadable Speculoos paste to apply liberally to your morning toast! Anyway, back to the chausson. It’s a really good pairing. Whilst not over-powering the apples, the addition of speculoos provides a substantial kick of cinnamon. It’s like taking the classic American apple and cinnamon pie filling, putting it in a French butter casing and giving it a Belgian accent. Using crumbled biscuits as a topping is an interesting addition. It gives a satisfying crunch to the pastry which contrasts nicely with the smoothness of the apples. Definitely recommended! So where can you find this chausson au speculoos, you ask?